Mobile retailer Carphone Warehouse has announced it is to drop the price of the Wi-Fi + 3G Motorola Xoom just days before the Android tablet officially launches in the UK. Following reports that the Xoom has sold just 100,000 units in the US since its February launch compared to the estimated 2.6 million iPad 2 tablets shifted in the few weeks since its arrival, Carphone Warehouse has followed the likes of PC World in dropping the price of the Android 3.0 touting device. 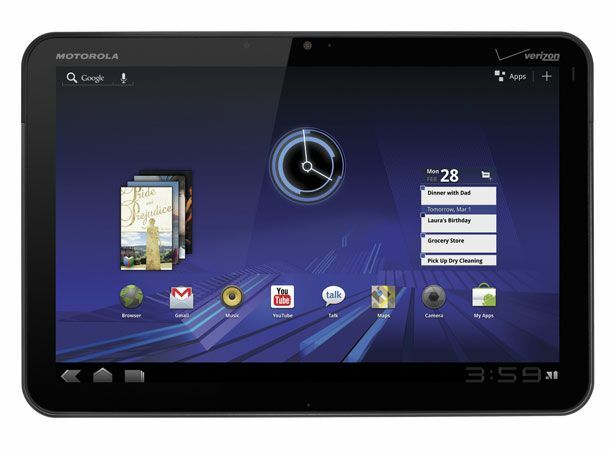 Having cut the Xoom's price tag, Motorola's first foray into the tablet market will now touch down on UK soil with the 32GB Wi-Fi + 3G model priced £579.99. Originally believed to be hitting the UK in the first week of April, Carphone Warehouse's new release states the device will now “launch in-store in mid-April,” suggesting possible delays. Attempting to further sweeten this cut priced deal and tempt consumers away from the iPad 2 and towards the Xoom, the Carphone Warehouse will throw in a Xoom dock, worth £35, free of charge for anyone taking up the offer. Those wannabe Xoom owners looking to pick the Honeycomb tablet up as part of subsidised tariff deal will be able to get the same specced device for just £199.99 through Talkmobile as part of a two year £25 per month contract that includes unlimited internet access. Can the Xoom challenge the iPad 2 atop the tablet charts or is it doomed to failure? Let us know what you think via the T3 Twitter and Facebook feeds.